Fraudulent trading main reason behind Bitcoin bubble? Could fraudulent trading have been the main reason for Bitcoin's massive price spike in late 2013? 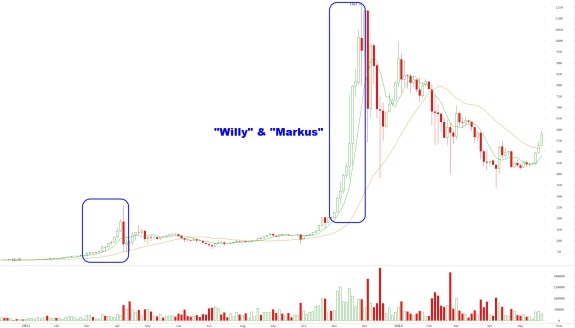 If The Willy Report is correct, the nearly tenfold increase in the Bitcoin's price within the span of little more than one month was fabricated by pumping hundreds of millions of dollars of fake liquidity into the Mt.Gox market. It should be noted that this automatic trading didn't do it all by itself but was definitely one of the catalysts behind Bitcoin reaching its all-time high price in November. Basically, a random number between 10 and 20 bitcoin would be bought every 5-10 minutes, non-stop, for at least a month on end until the end of January. Each time, (1) an account was created, (2) the account spent some very exact amount of USD to market-buy coins ($2.5m was most common), (3) a new account was created very shortly after. Repeat. In total, a staggering ~$112 million was spent to buy close to 270,000 BTC – the bulk of which was bought in November.